What is Rattle, Battle, Grab the Loot like? 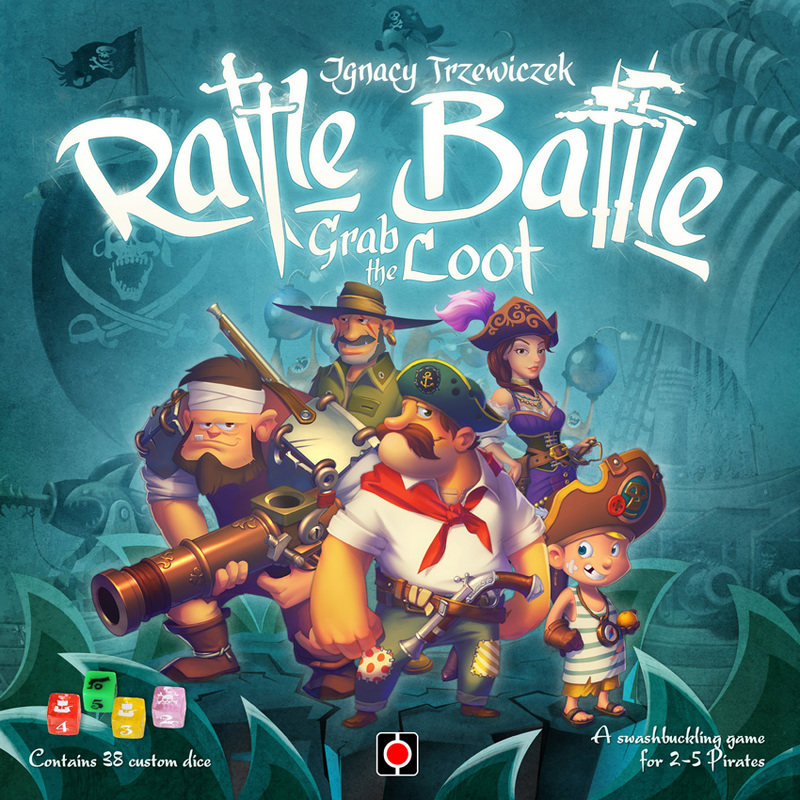 Rattle, Battle, Grab the Loot is pirate game. 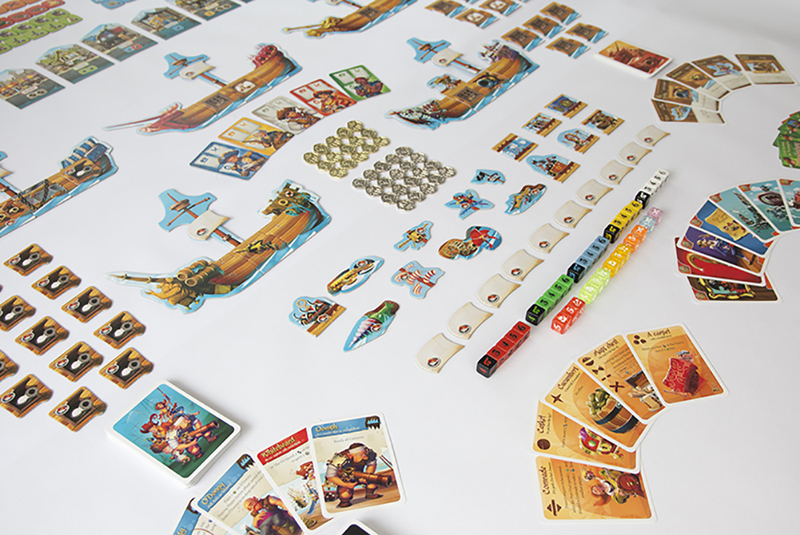 Players control a fleet of ships and will compete against the other players to become the most infamous pirate. Players will get several custom dice to represent their pirate fleet. Each game starts with the players choosing a scenario that, contains a specific amount of random quests. Most of these quest will resolve in a battle where all players will use their ships to battle different enemy ships. Each player also gets the option to visit the port several times during a game. Here they can spend their hard-earned loot to upgrade their ships, acquire new crew members and to get their hands on victory point cards. The core of the game is based around the ship battles, that occur as part of many of the quests. Each quest has a different set-up, but they all use the box as a big tray to drop all the beautiful custom dice in. Players decide how many ships they want to commit to the battle after having read the briefing. The briefing includes the number of enemy ships and their abilities. Then all the players dice and the enemy dice are picked up and dropped in the box to randomize the dice and their position. Then the various special abilities are used, players measure and move their ship around to try to either sink or board the enemy ships. The battles provides the players with various loot, that they can spend at the port. This happens at different times during the game, based on the scenario. Here the players can buy different things. They can spend the loot to upgrade their ships to become more powerful in the upcoming battles. It’s also where they can visit the guild to spend their coins on victory point cards. At the and of the last quest in the scenario the player with the most victory points (from victory point cards, crew cards and remaining coins) is of course the winner. I really wish I loved this game, because it has so many great things going for it. Overall it’s fun to play and very thematic, and it looks great. The art style is such a good fit for the silly theme and it really helps the game come alive. I love the silly theme of it and how well the theme permeates the game and the rules. But I just feel it’s to complicated for what it’s suppose to be, a quick silly pirate game. The way the dice drop and the ship battles work is very innovative, but it just adds a lot of extra complexity. It starts out pretty simple but quickly becomes very complicated due to more and more enemies along with the players getting more and more upgrades for their own ship. It’s a game I feel would appeal to younger kids and families, but the complex fiddly rules make it a bad match for them, and the more experienced players might find the game lacking. I also think the game takes to long. Overall I feel it’s an over-engineered game that could have been a lot better if some of the extra complexity would have been removed. I fell most parts of the game is relativity simple to understand, but the rulebook is rather long and confusing to read. The whole ship battle phase is what makes the game complicated. I feel like there are just to many special rules and to many situations that are not easily resolved. The father you’re into the game the more of a problem this becomes, since players will have new upgrades on their ships.